This harpsichord was built for me by Byron Will in 1992. 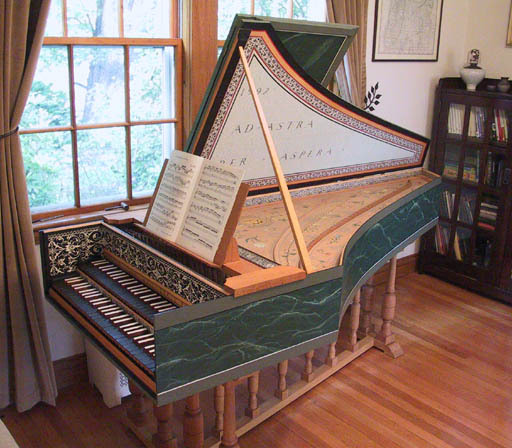 It is a reproduction of a 17th century double-manual Flemish harpsichord. While living in Portland I occasionally loaned the instrument out for concerts. It was also used on a recording of organ and harpsichord music by Nancy Metzger. I'd played piano before getting the harpsichord, and the technique is completely different. It took me a long time to make the switch. (Now I have trouble playing piano.) One interesting aspect is that the strings are plucked (as opposed to being hammered, as on a piano), with a constant volume, independent of how hard you hit the keys. This leads to completely different techniques to create texture. Instead of varying pressure, you subtly control the amount of overlap between notes. You can change the overall dynamic level and tone by using just one manual, or coupling them together - each plucks its own set of strings, with a slightly different sound. Open of lock file "/HITS/.lck" failed.